Merrell says:"The comfort and mobility of our stretch woven Belay Capri make it perfect for everything from bouldering to your evening run." I've worn the Merrell Belay Capri Lightweight Walking Trousers for women for Nordic Walking, running and a few short, low level walking trips. Sitting slightly below one's natural waist, they are certainly an extremely comfortable and flattering pair of trousers. The fit was fine - although I personally find the Merrell sizing to be on the generous side. 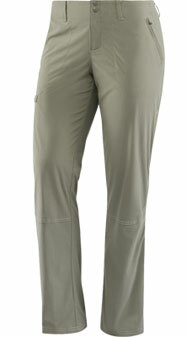 The soft, nylon/elastane mix fabric has a good sideways stretch so the range of movement is excellent. The concealed waist band, which includes belt-loops, is also elasticated and is finished with a good soft lining. There are two, hand-warmer pockets - these are zipped so great for smaller valuables. There is also one larger, cargo-style pocket which is also zipped. There didn't appear to be much rain resistance in the fabric as the trousers wetted out quickly in rain. However they did dry pretty quickly. My personal preference is for a full-length trouser for a long day's hill-walking - particularly if I'm likely to be walking through longer grass when I'll want to make sure I'm not being bitten by any nasties especially ticks. However, the Merrell Belay Capri Lightweight Walking Trousers are a great option for a range of other high energy activities when you need extensive freedom of movement coupled with sun protection and good moisture management. Smart enough for leisure wear around town, these are an extremely versatile pair of trousers.